The Thunder, presented by NJM Insurance, will return one of their most popular promotions during the 2019 season when the team rebrands as the Thunder Pork Roll for Friday night home games. Beginning on Friday, April 26, the Thunder Pork Roll will take the field with a new set of special uniforms and hats that they will wear on each Friday night throughout the season. "I'm so excited for Thunder Pork Roll nights this season that I got up this morning and ordered a Case's Pork Roll, egg and cheese sandwich on an everything bagel from my local deli," said Thunder Pork Roll GM/COO Jeff Hurley. "We wanted to continue our celebration of this Garden State favorite this season and I think our fans will love seeing the new uniforms and on-field hats with our premium giveaways scheduled for Friday night games." 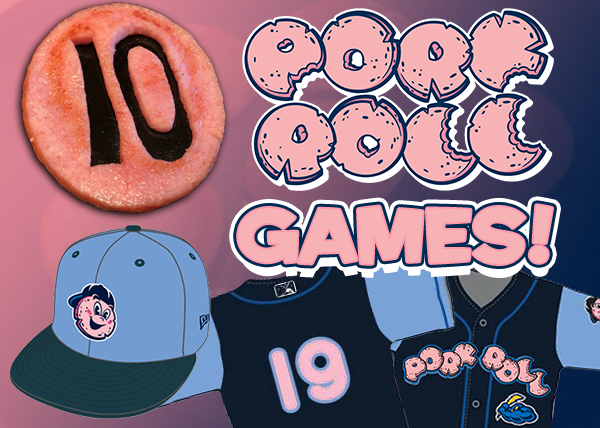 Ten Friday night home games during the 2019 season will feature the Thunder Pork Roll with special $2 pork roll sandwiches and premium giveaways and promotions that fans won't want to miss. Friday, April 26 vs. Erie SeaWolves - Miguel Andujar Bobblehead giveaway, presented by NJM Insurance. Friday, May 10 vs. Portland Sea Dogs - Ode to Philly Night, post-game Fireworks. Friday, May 17 vs. Binghamton Rumble Ponies - NJ Pork Roll Flash Hat giveaway to the first 1,000 fans, ages 14 and up. Friday, May 31 vs. Harrisburg Senators - Luis Severino Bobblehead giveaway, presented by Capital Health. Friday, June 7 vs. Erie SeaWolves - Breast Cancer Awareness, Pink Baseball giveaway, presented by Radiology Affiliates Imaging. Friday, June 28 vs. New Hampshire Fisher Cats - Scout Sleepover, Vs. Cancer Head Shaving Event. Friday, July 5 vs. Hartford Yard Goats - Jersey Night. Friday, July 19 vs. Hartford Yard Goats - Justus "Chef-Field" Bobblehead giveaway, Scout Sleepover. Friday, August 9 vs. Harrisburg Senators - Bernie Williams Bobblehead giveaway, Scout Sleepover. Friday, August 30 vs. Reading Fightin Phils - Gleyber Torres Hand Mask giveaway, first 1,000 fans, ages six and up. Bobblehead giveaways are for the first 1,500 fans, ages 14 and older. All other giveaways listed are first 1,000 fans, ages 14 and older, unless otherwise noted. Distribution of promotional items is for guests in attendance only, while supplies last. All promotions, dates and giveaways are subject to change and/or cancellation. Fans can secure their tickets to 2019 Thunder Pork Roll games by purchasing a package plan. Pic-a-plans, Mini Plans, Full and Half Season Tickets are on-sale now by phone at 609-394-3300 and online by clicking here.